Rehabilitating the edentulous upper jaw with implant-supported dentures requires long-term maintenance of the prosthesis. This review aimed to evaluate the literature on prosthodontic maintenance requirements for maxillary implant overdentures using different prosthodontic designs. The authors conducted electronic searches on Medline, PubMed and Google Scholar. In addition they hand searched 15 dental journals and the reference lists of identified articles. English language studies (Randomized controlled trials, prospective and retrospective studies) reporting on prosthodontic maintenance of maxillary implant overdentures only were included. 18 articles were included (8 prospective, 10 retrospective) with follow-up periods of between 3 months and 10 years. Prosthodontic maintenance requirements of maxillary overdentures area direct consequence of the attachment system, together with differing numbers and distributions of implants. The reviewed literature does not provide a clear controlled indication of prosthodontic maintenance requirements of maxillary overdentures for different prosthodontic designs and attachment systems. 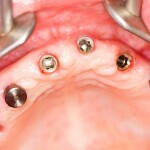 Future standardization of maxillary implant overdenture design is recommended, and universally accepted criteria for reporting maxillary implant overdenture maintenance should be implemented to establish accurate comparative data analysis. While there are subtle differences between Medline and PubMed the same core database is being searched and for some topic areas this approach may not identify additional references. The hand searching of the some of the better known dental journal used here may well have helped identify additional studies but the limited number of databases used and the restriction to the English language may mean that not all the relevant literature has been identified a point noted by the authors in the discussion. The authors highlight difficulties with the quality of the literature although they did not report a formal quality assessment of the included studies. The large number of retrospective studies raises issues in relation to recall bias and there is also the challenging issue of what is acceptable maintenance. The wide range of systems available and the lack of consensus on what are important outcomes in this area are raised by the authors. Osman RB, Payne AG, Ma S. Prosthodontic maintenance of maxillary implant overdentures: a systematic literature review. Int J Prosthodont. 2012 Jul-Aug;25(4):381-91. Review. PubMed PMID: 22720290.